"D'Artagnan" redirects here. For other uses, see D'Artagnan (disambiguation). Illustration from Courtilz de Sandras' novel Les mémoires de M. d'Artagnan. Charles de Batz de Castelmore (French pronunciation: ​[ʃaʁl də bats də kastɛlmɔʁ]), also known as d'Artagnan and later count d'Artagnan (c. 1611 – 25 June 1673), was a famous French Musketeer who served Louis XIV as captain of the Musketeers of the Guard. He died at the Siege of Maastricht in the Franco-Dutch War. A fictionalized account of his life by Gatien de Courtilz de Sandras formed the basis for the d'Artagnan Romances of Alexandre Dumas, père, most famously including The Three Musketeers (1844). The heavily fictionalized version of d'Artagnan featured in Dumas' works and their subsequent screen adaptations is now far more widely known than the real historical figure. D'Artagnan was born at the castle of Castelmore near Lupiac in south-western France. His father, Bertrand de Batz lord of Castelmore, was the son of a newly ennobled merchant, Arnaud de Batz, who purchased the castle of Castelmore. Charles de Batz went to Paris in the 1630s, using the name of his mother Françoise de Montesquiou d'Artagnan. D'Artagnan found a way to enter into the Musketeers in 1632 through the support of his uncle, Henri de Montesquiou d'Artagnan or perhaps thanks to the influence of Henri's friend, Monsieur de Tréville (Jean-Armand du Peyrer, Comte de Troisville). D’Artagnan joined the guards in the mid-1630s and served under Captain des Essarts. The regiment saw much action in the early 1640s, taking part in sieges at Arras, Aire-sur-la-Lys, la Bassée and Bapaume in 1640–41 and Collioure and Perpignan in 1642. Whether or not d’Artagnan was personally involved is unclear, but it is likely he took part in some, if not all, of these sieges. While in the Musketeers, d'Artagnan sought the protection of the influential Cardinal Mazarin, France's principal minister since 1643. In 1646, the Musketeers company was dissolved, but d'Artagnan continued to serve his protector Mazarin. D'Artagnan had a career in espionage for Cardinal Mazarin, in the years after the first Fronde. Due to d'Artagnan's faithful service during this period, Louis XIV entrusted him with many secret and delicate situations that required complete discretion. He followed Mazarin during his exile in 1651 in the face of the hostility of the aristocracy. In 1652 d'Artagnan was promoted to lieutenant in the Gardes Françaises, and fought at the Battle of Stenay in 1654, as well as in sieges at Landrecies and Saint-Ghislaine, then to captain in 1655. In 1658, he became a second lieutenant in the newly reformed Musketeers. This was a promotion, as the Musketeers were far more prestigious than the Gardes-Françaises. D'Artagnan was famous for his connection with the arrest of Nicolas Fouquet. Fouquet was Louis XIV's finance commissioner and aspired to take the place of Mazarin as the king's advisor. Fouquet was also a lover of grand architecture and employed the greatest architects and artisans in the building of his Chateau Vaux-le-Vicomte. He celebrated the completion with a most extravagant feast, at which every guest was given a horse. The king however felt upstaged by the grandeur of the home and event and, suspecting that such magnificence could only be explained through Fouquet's pilfering the royal treasury, three weeks later had d'Artagnan arrest Fouquet. To prevent his escape by bribery, d'Artagnan was assigned to guard him for four years until Fouquet was sentenced to life imprisonment. In 1667, d'Artagnan was promoted to captain-lieutenant of the Musketeers, the effective commander as the nominal captain was the king. As befitted his rank and position, he could be identified by his striking burgundy, white, and black livery—the colours of the commanding officer of the Musketeers. Another of d'Artagnan's assignments was the governorship of Lille, which was won in battle by France in 1667. D'Artagnan was an unpopular governor and longed to return to battle. He found his chance when Louis XIV went to war with the Dutch Republic in the Franco-Dutch War. 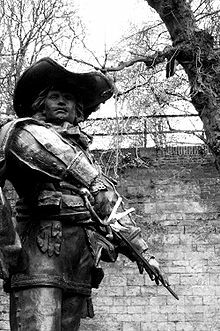 After being recalled to service, d'Artagnan was subsequently killed in battle on 25 June 1673, when a musket ball tore into his throat at the Siege of Maastricht. The French historian Odile Bordaz believes that he was buried in Saint Peter and Paul Church in Wolder, the Netherlands., but the archaeologist Wim Dijkman, curator of Maastricht, which Wolder is a district says that there are no historical or archeological information to say that. D'Artagnan married on March 5, 1659, Anne-Charlotte Boyer de Chanlecy lady of Sainte-Croix, born in 1624 (daughter of Charles Boyer, lord of Chanlecy and Sainte-Croix and of Claude de Rymon, lady of la Rochette) widow of Jean-Elenor de Damas. But quickly the two spouses didn't live together anymore. D'Artagnan preferred the battlefields and his wife left Paris and lived on his land of Sainte-Croix where she died on December 31, 1683. They had two children: Louis (the eldest) born in 1660 and Louis (the youngest) born on July 4, 1661, in Chalon-sur -Saône. They both became military. 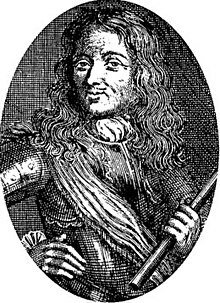 Louis de Batz de Castelmore (the eldest), took the title of count d’Artagnan and died at the castle of Castelmore in December 1709. Louis de Batz de Castelmore (the youngest), knight, later as known as count d’Artagnan, baron of Sainte-Croix, lord of Chanlecy and Castelmore, became maréchal de camp. He married on May 21, 1707 Marie Anne Amé (1670–1714) and died at the castle on June 7, 1714 at the castle of Sainte-Croix. He had two sons : Louis-Gabriel and Louis-Jean-Baptiste. Louis-Gabriel de Batz de Castelmore, born in 1710, as known as marquis of Castelmore and baron of Sainte-Croix, cavalry officer then gendarmerie officer. He sold on October 30, 1769 the castle of Castelmore. He died in Paris on August 15, 1783 at the age of 73. He married on July 12, 1745 Constance Gabrielle du Moncel de Lourailles (1720-1764), widow of Joseph II Bonnier de la Mosson. He had a son Louis Constantin. Louis Constantin de Batz de Castelmore, born in Paris on July 25, 1747, Cavalery officer in the régiment Royal-étranger in 1764 in Strasbourg. He became second lieutenant on April 5, 1764, capitaine captain in 1765, capitaine in 1772, assistant-major on March 2, 1773. When his father died, he is present on August 16, 1783 fort the seals to his apartment in Paris. He married on April 24, 1793 Jeanne Molé (born in 1755). He lived in Paris then he emigrated during the French Revolution Révolution. In 1809 he lived for two years at the prince of Bauffremont's castel at Scey-sur-Saône. On March 16, 1826, he declared before a notary that he lives for twenty years at the prince de Bauffremont's castel in Scey sur Saône and that he does not own anything and lives at the expense of the prince. He died at the castel of Scey sur Saône on December 14, 1827. He had two daughters : Louise-Constance (born in 1775) and Aglaé-Rosalie-Victorine (born in 1776). Louise-Constance de Batz de Castelmore, born on May 4, 1775 in Paris. She had a son Jean-Guillaume-Ernest Batz,born in Besançon on February 9, 1809, (his father is unknown). 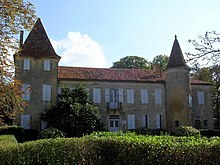 In 1833, she was still living at the prince de Bauffremont's Castel in Scey-sur-Saône, when she gives consent to the marriage of his son Jean-Guillaume Bats. She died on April 14, 1857 in Reims. Jean-Guillaume-Ernest Bats, born on February 9, 1809 in Besançon, silk manufacturer in Lyon, he married on February 9, 1834 in Lyon Julie Masson (1806-1839) with whom he will have a son François. He married on April 15, 1840 in La Guillotière Claire Billon (1818-1875). They had 3 children : Constance-Claudine (born in 1841), Louis-Alexandre (born in 1847), married on April 29, 1876 in Lyon Perret and Anne (born in 1850), married on April 12, 1883 in Lyon François Cholat. François Bats, born on November 30, 1834 in Lyon. Married on Novembrer 8, 1862 in Lyon Catherine-Charlotte Damaisin. He had two daughters : Claire de Bats (1863) married on February 22, 1883 Eugène Félix Marius Guilhaume and Jeanne-Anne de Bats. Jeanne-Anne de Bats, born on November 10, 1867 in Lyon, married on September 17, 1895 in Lyon Alfred Cahn. In 1969 their grandson Maurice Cahn was allowed to change his name to « Bats » in memory of his ancestor the famous French musketeer Charles de Batz de Castelmore as known as d'Artagnan. Aglaé-Rosalie-Victorine de Batz de Castelmore, née le 4 septembre 1776 à Paris. 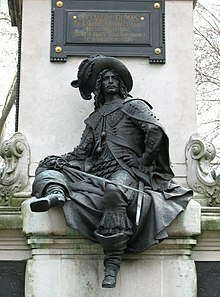 Statue of d'Artagnan on the Dumas monument in Paris. The real d'Artagnan's life was used as the basis for Gatien de Courtilz de Sandras' novel Les mémoires de M. d'Artagnan. Alexandre Dumas in turn used Sandras' novel as the main source for his d'Artagnan Romances (The Three Musketeers, Twenty Years After and The Vicomte de Bragelonne), which cover d'Artagnan's career from his humble beginnings in Gascony to his death at Maastricht. Although Dumas knew that Sandras's version was heavily fictionalised, in the preface to The Three Musketeers he affected to believe that the memoirs were real, in order to make his novel more believable. D'Artagnan is initially portrayed by Dumas as a hotheaded youth, who tries to engage the Comte de Rochefort and the three musketeers, Athos, Porthos, and Aramis in single combat. He quickly becomes friends with the musketeers, and has a series of adventures which put him at odds with Cardinal Richelieu, then First Minister of France. In the end, Richelieu is impressed by d'Artagnan, and makes him a lieutenant of the musketeers. This begins his long career of military service, as detailed in the sequels. D'Artagnan's role among the musketeers is one of leadership (his skills and brains impress the musketeers greatly), but he is also regarded as a sort of protégé given his youth and inexperience. Athos sees him not only as a best friend and fellow musketeer but nearly as a son. At the end of the series, his death at the siege of Maastricht is given an extra tragic twist – he is mortally wounded while reading the notice of his promotion to the highest military rank. Some scholars believe aspects of D'Artagnan are drawn from the life and character of Dumas's mixed-race father, General Thomas-Alexandre Dumas. The incident when D'Artagnan challenges Porthos, Athos, and Aramis to duels on the same afternoon might be based on an incident in General Dumas's youth when he was insulted; and their subsequent friendship on General Dumas's youthful companionship with fellow soldiers in the Queen's Dragoons. French poet Edmond Rostand wrote the play Cyrano de Bergerac in 1897. After one of the play's famous scenes, in which Cyrano defeats Valvert in a duel while completing a poem, d'Artagnan approaches Cyrano and congratulates him on his fine swordsmanship. In Neal Stephenson's Quicksilver a story of d'Artagnan's death is related by one of the characters, Half-Cocked Jack. Musician Citizen Cope included a song titled "d'Artagnan's Theme" on his 2004 album The Clarence Greenwood Recordings. D'Artagnan is mentioned in Chapter 16 of Eric Flint's alternate history novel 1632, and in stories by Bradley Sinor in the 163x anthologies Ring of Fire III and Grantville Gazette V.
In the game Pokémon Black and White, a Pokémon is introduced named Keldeo. Keldeo belongs to a group of Swordsman Pokémon called The Swords of Justice, who are inspired by the Three Musketeers. Keldeo is inspired by d'Artagnan. In the video game Metro: Last Light, one of the characters repeatedly refers to the protagonist as D'Artagnan, comparing the duo to "two of the three musketeers" and himself to Athos. In the video game Monster Hunter Generations, one of the feline-type non-playable characters is named 'd'Artanyan', wearing a wide-brimmed hat and cape similar to many depictions of d'Artagnan. Athletic teams at Xavier University in Cincinnati, Ohio are called the Musketeers, and their mascot is named D'Artagnan after the character. Note: Cornel Wilde, in addition to his role listed above, played the same-named son of d'Artagnan as the main hero in At Sword's Point (1952); Tobias Mehler was similarly cast in the Young Blades series, while the indicated performance there by Shaughnessy was a single guest appearance as his famous father. Andrew Rannells voiced d'Artagnan in the Japanese manga series Dinosaur King. ^ "France – Land of the_Musketeers – Dominique's Villas". Archived from the original on 2008-12-04. ^ "The Real D'Artagnan". 30 December 2016. ^ The Times (November 2008). "En garde! Historian claims to have found d'Artagnan". Retrieved 19 April 2010. ^ Le Monde Culture du 20 11 2008. ^ Bulletin de la Société archéologique, historique, littéraire & scientifique du Gers, vol. 84–85, Impr. Th. Bouquet, 1983, page 147. ^ a b Bulletin de la Société archéologique, historique littéraire & scientifique du Gers, 1973, p. 57 : extrait de baptême de M. le comte de Castelmor. Reconstitution des actes d’État-civil. Dépôt central palais de la Bourse. Entrée le 21 septembre 1872, No. 75e341. Pour copie conforme, Paris le 6 mai 1968. Direction des Archives de Paris. ^ Amédée Sevène, Notice sur Villemur: chef-lieu de canton de l'arrondissement de Toulouse (Haute-Garonne), 1898, p. 70. ^ René Batz, Études sur la contre-Révolution : la vie et les conspirations de Jean, baron de Batz, 1908, page 45. ^ Henri Castex, La descendance des Mérovingiens ? : les d'Artagnan toujours dans l'histoire, Éditions L.P.F., 1985, p. 40. ^ a b c d e f g h i j Société archéologique, historique, littéraire et scientifique du Gers, docteur Maurice Bats « La postérité de d’Artagnan », Impr. F. Cocharaux, Auch, 1973, pages 55 à 60. ^ Louis Grasset-Morel, Les Bonnier, ou, Une Famille de financiers au XVIIIe siècle, E. Dentu, 1886, p. 152. ^ a b c d e Odile Brel-Bordaz, D'Artagnan, mousquetaire du roi : sa vie, son époque, ses contemporains, Éditions du Griot, 1995, p. 97–98. ^ Bulletin de la Société archéologique, historique, littéraire & scientifique du Gers, vol. 74, 1973. ^ Bulletin de la Société archéologique, historique, littéraire & scientifique du Gers, vol. 74, p. 60. ^ Sur la descendance contemporaine en ligne féminine de d'Artagan. ^ Bulletin de la Société archéologique, historique, littéraire & scientifique du Gers, vol. 74, p. 57. ^ Tom Reiss, The Black Count: Glory, Revolution, Betrayal, and the Real Count of Monte Cristo (New York: Crown Publishers, 2012), 8, 77, 86; Claude Ribbe, Le diable noir (Monaco: Alphée, 2008), 17-18. ^ "Russian animation in letters and figures. Movies. Dog in Boots" [Российская анимация в буквах и фигурах. Фильмы. "Пес в сапогах"] (in Russian). Animator.ru. Retrieved 2 May 2010.
docteur Maurice Bats, Descent of d’Artagnan, Impr. F. Cocharaux, Auch, 1973, pages 55 à 60. Wikimedia Commons has media related to d'Artagnan. This page was last edited on 5 April 2019, at 20:51 (UTC).